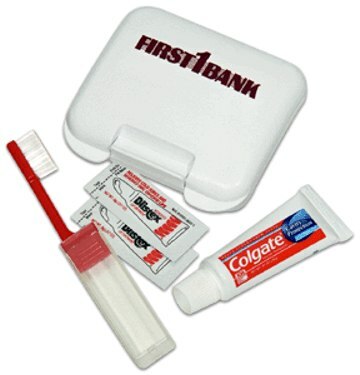 Promotional Dental Kits, Personalized in Bulk, with Colgate Toothpaste, Travel Toothbrush and 2 Blistex Packets. Bulk dental kits, custom imprinted in hard plastic box. We also supply blank (not imprinted) wholesale pocket dental kits for $2.50 each. Lowest prices in the USA for wholesale pocket dental kits. Free artwork design. American clients pay no taxes. We will send you a proof for your approval before production. Unit prices below include your one-color custom imprint. Set-up Charge: $45.00 per color. Production Time: 10 days. Rush 3-days production is available: contact us. Sturdy, hard plastic pocket box with a travel toothbrush in assorted colors (toothbrush color will vary from kit to kit), a tube of Colgate toothpaste and 2 Blistex packets. Case Colors: Blue or White. Design your own dental kit (determine contents)! Contact us for quotation.